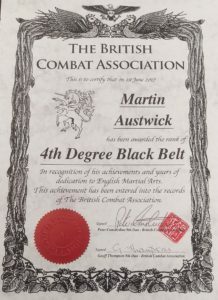 Martin “Oz” Austwick is the founder, and Chief Instructor of the English Martial Arts Academy. He has been studying and teaching traditional English Martial Arts for over 20 years. As a teenager he studied first Aikido and then Shotokan Karate under Sensei Enoeda in the KUGB. However when he discovered the existence of English Martial Arts he gave up training in Oriental arts, and focused exclusively on English Ones. He was a founder member of the Historical European Martial Arts Coalition, and was part of a small group of instructors who coined the term “HEMA”. 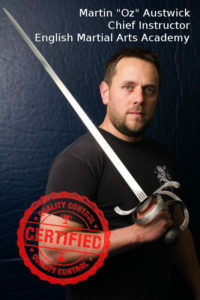 He has taught Elizabethan English Backsword across the UK, Europe and the World and is recognised as one of the world’s leading authorities on the system first described by George SIlver in 1599. 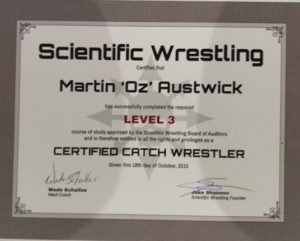 He also teaches Catch as Catch Can Wrestling and is certified to Level 3 by the Scientific Wrestling Program. He has studied under such coaches as Billy Robinson, Wade Schalles, Josh Barnett, Marty Jones, and Roy Wood. In 2017 Oz was awarded the level of 4th degree Black Belt by Peter Consterdine and Geoff Thompson in the British Combat Association.